Pauline Mary Yong, 54, hopes to inspire others to maintain an active and fit lifestyle as they grow older. The 1.75-metre tall British-born Singapore-based mother of two is a finalist of the Singapore Fitness Model Search. Although she is the oldest contestant in the competition, she boasts fitness levels that will put many half her age to shame. She regularly competes in marathons, duathlons, triathlons and cycling events, often finishing within the top three of her age group. 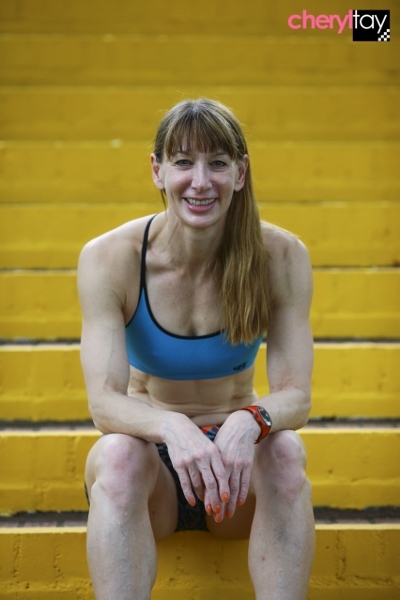 Some of her achievements include winner of her age group for the Swissotel Vertical Marathon twice in 2010 and 2011, the HP Tri Factor Bike 2010 40km, Tri Factor 2011 Bike 45km, Singapore Duathlon 2011, Tribob Sprint Series 2011, Aviva Triathlon 2007, Tribob Singapore Sprint Series 2011 Sprint Duathlon and Series champion, and the Pulai Triathlon 2006. Another notable achievement is the London Triathlon 2010 Olympic distance where she came in third for her age group. Read the full story on Fitness Sutra.